Penny Dreadful by Laurel Snyder. Review: It wasn't dreadful at all when I read Penny Dreadful by Laurel Snyder! In this story, 7-year-old Penelope Grey is bored and lonely with no one to talk to except her parents and staff until her family inherits a house in Tennessee, where everything changes. Her parents start out incredibly wealthy until Dirk, Penelope's dad, loses his job, causing the three to struggle with money and finding a home. After Penny moves, she meets friends that help her along the way and show her what it's like to live in Thrush Junction. There's Luella, the crazy, spunky risk taker with an attitude that will definitely make you giggle. Jasper is an animal lover, with a house that's practically an animal shelter. Last but not least, there is Duncan who has over-protective parents that think he's allergic to almost every food. The four friends do amazing things together throughout the book, which is the main reason why I loved it. The story begins with Penelope Grey sitting in her huge mansion of a home with nothing to do at all except read her book. She's always bored and thinks she always will be. Penelope is a home-schooled girl with no real friends. She waits for her father to come home from work, and when he does, she gets a big surprise. Her dad has quit his job. She doesn't mind that her father has done that. At that time, she doesn't care at all. However, a couple weeks later, she notices the staff that works at her house starts disappearing one by one. That's when Penelope gets confused and worried. Penelope tries to figure out what is happening. After over hearing her parents talk, she concludes that they are running out of money, and that the family would all have to move. One day, her mother gets a letter from Thrush Junction, Tennessee. They are inheriting a house from a deceased family member. This is the perfect solution for them all. 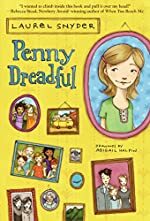 After they get to their new home, Penelope finds a box of Penny Dreadfuls and decided to change her name and go meet some new friends. They all have something fun to do every day, whether it is having worm races or going to the shop to buy penny candy. Along the way, she finds a box that includes the amount of debt that Penny's mother and father need to pay off. It is definitely a big amount. Then, Penny gets worried, and is determined to make the money herself. She just HAS to do something. She just can't think of anything, but with the help of her friends, they finally decide to go search for gold in a huge cave. Is Penny successful? Does her family succeed? I rate Penny Dreadful a ten out of ten because I enjoyed all the adventure that was in the book. I also liked the fact that there is a lot of teamwork in the story, which I enjoyed as well, because it's one of the most important things that you need in life. I could not attempt to put down this book down once I started reading! Penny Dreadful is so interesting. It shows readers the importance of never giving up, just like Penny. It gives many life lessons in the book like these and more. Once I finished reading, I actually felt a little sad because I wanted to read more! I wouldn't say that there is any bad language, but this story involves mature situations like losing a house or money, and people tend to be frustrated in many parts of the book, therefore I think this should be for middle-school readers and older. We would like to thank Random House for providing a copy of Penny Dreadful for this review. Have you read Penny Dreadful? How would you rate it?